ob·ses·sion; /əbˈseSHən/; an idea or thought that continually preoccupies or intrudes on a person's mind. The culmination of our last three years of work is here- a combination of MTB handling and moto acceleration that must be ridden to be believed. Drop that outside foot, turn your hips into the corner, dig those side knobs in hard...and twist that throttle. Tangent's obsession with trail performance means our motor unit integrates seamlessly into the drivetrain of modern enduro bikes. 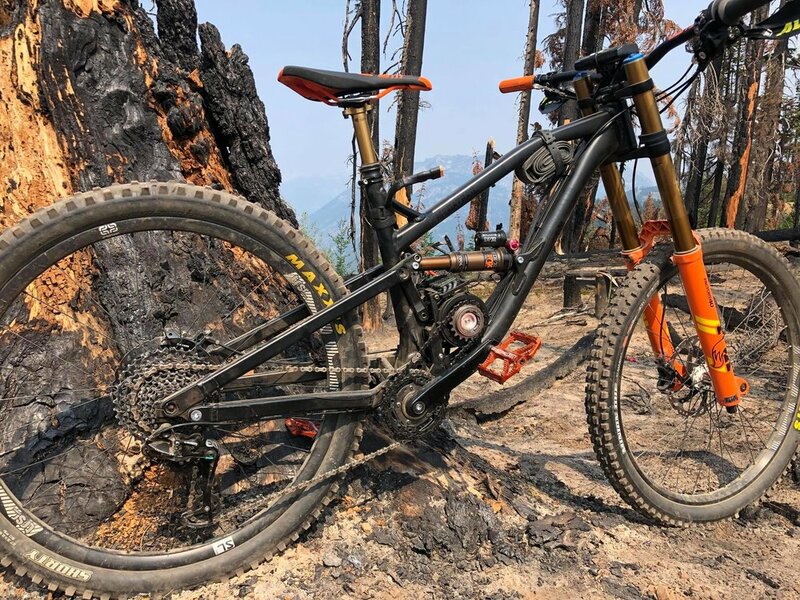 The same pedal driveline accepts 8kW of Tangent oomph with zero impact on pedaling performance, meaning your trail beast is the definition of dual sport. 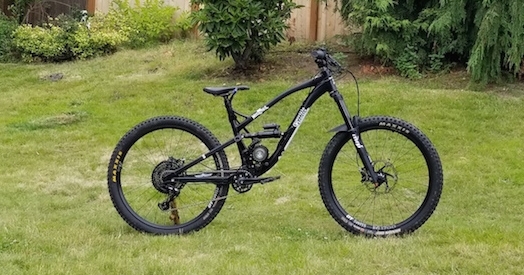 Modern enduro/DH bike handling meets tire spinning, wheelie pulling power allowing you to attack the trail with an array of MTB and moto skills that have been technically unavailable, until now. SRAM's EX1 drivetrain built specifically for ebikes. Hardened steel cassette, steel front rings, plus 8 speeds provide the ideal increments from 20mph to 90mph. Max fill angular contact bearings inside the frame, suspension axles provide preload and are clamped in place. A very rigid setup. Hand built in Colorado, Guerrilla Gravity bikes are renowned for their quality, dependability and geometry that is eager to go fast. Tangent keeps the package nimble by correctly locating the 7lb engine just above and forward of the BB, placing the center of gravity between your ankles and above the pedals for predictable handling at speed. Tangent's drive unit uses a standard 32t chainring to drive the derailleur, just as the frame designers intended. Did we mention the motor unit is removable? Well, it is, allowing you to convert your trail beast back to is analog equivalent in 5 minutes using only a 4mm hex. Other high end eMTB’s are only that, an eMTB, for use on MTB trails when allowed. Tangent opens the world of motorized trails to MTB riders with enough power to chase down the motos. Our custom mounting bracket. CNC'd, pinned and welded, only about a pound of hardware is left on the frame after removing the drive. Sans motor, nobody on your local MTB trails or regional race association will know the difference. Race the same bike you’re used to riding fast.